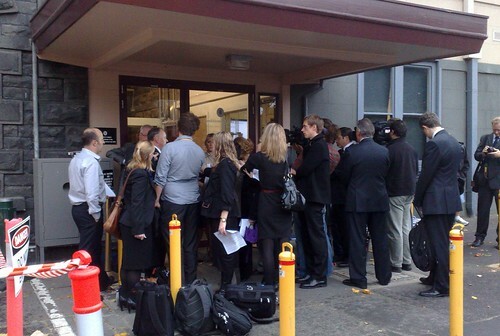 Stakeholder and interest group commentary on the State Budget usually happens out the back of Parliament. And when it starts raining, everybody huddles under the shelter near the back door. Four new stations on existing lines to be built — Caroline Springs (V/Line), Williams Landing, Lynbrook and Pakenham Lakeside. Not before time. Fifty new trams, and a depot upgrade. Probably mostly replacements for the worst of the Z-class trams, and the 5 borrowed Bumblebees (though the new ones will start showing up well after they’ve gone home). So this will provide more capacity, but not higher frequency — though it’s capacity which is the bigger problem at peak times. Extra station staff — twenty stations upgraded to Premium (fulltime staff), twenty-two to Host (peak-hour only staff). A good step forward, though still about half of all Melbourne stations still won’t have any staff in the evenings, which is when people are most nervous about using the trains. Buses? Nothing. Nada. Zilch. Apart from a handful of regional inter-town links designed strictly for people who don’t have any other way of getting around, there are no new bus upgrades at all. So if you’re in a bus-only suburb, out of reach of trains and trams, with your local bus that runs every 30-60 minutes, and thus stuck with driving everywhere, expect no change there. Spin? Ho yeah. The government managed to re-announce the Regional Rail Link project, the $4.3 billion diversion of the Geelong line via Tarneit, Deer Park and Sunshine, which was mostly funded by the Federal government in last year’s Federal budget. I guess the state gets to claim it because they’re money-laundering the Feds’ money. Neat. The other snippet that came out was that they don’t expect Myki to be running on trams until September, perilously close to the state election. Update lunchtime: Scan of the pic from The Australian. This was taken during evening rush hour. I felt a right pillock standing there being snapped as the crowds walked by. I heard that the train trip from Geelong will take a couple of minutes longer. People can wear that if there are less delays. 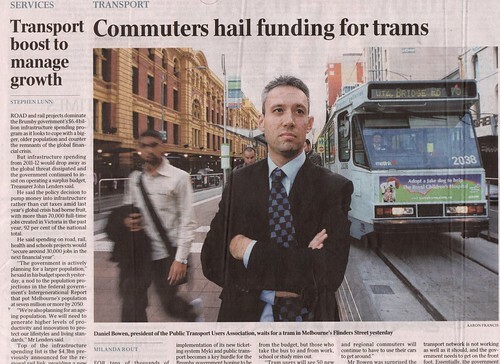 Paul, they were flagged in the Victorian Transport Plan in December 2008, but I’m pretty sure haven’t been funded until now, so it is “new money”. Andrew, yeah hopefully extra reliability will make up for it, though the “couple of minutes” is by no means guaranteed. Geelong people are still having to guess at what the real time impact will be. They should have photographed you peering over the top of a wall. Yes, I read The Australian, and read your article today. Had to agree with you on the non-train PT areas being neglected. Isn’t it interesting that they’ve said they’re not expecting myki to be fully operational until after the election!! Hmmm, could it be because they don’t want to remind people what a total disaster it has been prior to the election? Yesterday I saw Ted Baileau on TV and I thought he sounds really unkind. I will never let my parents vote for liberals. My kids get off at North Brighton station to go to school. My 12 yo justed asked, “Why North Brighton [ to get premium status]?” I suppose it’s because of number of station users? So ‘Phillip’, do you have any actual reasonable grounds against the Liberal Party? But I take it from your comment that you’re not old enough to vote anyway. Andrew V, you’re not going to believe this, but that expression (or versions thereof) have been around for a lot longer than Rush Limbaugh has been broadcasting. Phillip, if I were your parents, and transport was their pet issue, I’d recommend they wait until they know what the parties’ policies are before deciding how to vote. I know this is beside the point, but can I just comment on how smashing you look in that photo in The Australian? Getting more and more handsome as the years pass! PS While I’m in a complimentary mood. I’d also like to thank you for your many years of commitment to the PTUA and the terrific job you do of bringing transport issues to the attention of the media. Those of us who complain privately about public transport, but rarely do anything constructive about it, we all owe you a debt of gratitude. No doubt your actions have had, and continue to have an influence on government policy and transport reforms. So Phillip, you’re blindly going to vote for a party that has wasted $1.4 billion on myki, tolled Eastlink after promising they wouldn’t, hasn’t done a thing to secure our water and energy supply, and has sent the cost of houses sky high because of its silly urban sprawl cap, not to mention the failure in ensuring our PT infrastructure is properly upgraded or maintained? If that’s the case, you have absolutely NO right to complain about these issues if you will blindly vote these people back in! There’s a cliche which sums this up: Fool me once, shame on you, fool me twice, shame on me! By the way, remember three years ago, the argument was that the federal government had been in 11 years, so it was time for a change- that was the media narrative! Hmmm, shouldn’t that apply here? Andrew, that catchphrase is at least as old as “Get Smart”. Why East Richmond as a premium station? ^ Marginal ALP seat perhaps? I guess the main reasons for premium stations would include: (a) known trouble spot, (b) heavy usage, particularly at night, (c) minimum of work needed to bring facilities up to scratch, and (d) marginal electorate. I can’t judge East Richmond on (a) and (c), but it is in an areas with a lot of people around late at night (though I’m not sure it makes the station itself a busy one; when I’ve been there at night it’s been quiet, probably because most trains bypass it), and as for (d), it’s possible the ALP might see Richmond might be at risk of going Green. The website is an integral part of the Myki experience. Without it functioning, it is no different to a metcard – except that it is made out of hard plastic. A metcard enables you to do everything a Myki can do at the moment, validate at the station and purchase the relevant fare for the day. The website is meant to allow you to do everything from the comfort of your own desk chair so that all you have to do once you arrive at the station is touch on and wait. With the website malfunctioning, I still need to worry about carrying the relevant money (because the machine won’t give change that is over a certain amount). I think the government needs to be seriously concerned with having the website fully functioning by the election if you ask me. The $1.4 billion on myki is indefensible. The cost of houses is sky high because the government isn’t allowed to do anything to reduce them. The cost of *new* houses in the outer suburbs would always be relatively high; and the cost of providing infrastructure to them (or, alternatively, living there without the infrastructure) would be excessive. In any case, many people have realised that all you need to do is live just a little bit further out—in Bacchus Marsh instead of Melton—and you’re free of any urban growth boundary, because Moorabool Shire, unlike the Shire of Melton, isn’t part of Melbourne. The Labor government has done more for PT infrastructure than the previous Liberal government. In any case, what I hear coming out of Ted Ballieu and the opposition spokesman for travel is that they wouldn’t “waste” any money on … any transport initiative, but that they would extend the services. This isn’t a literal quote of course, but if they can’t come out with a coherent line I would find it terribly difficult to vote for them. As for the “its time” argument, that’s not an argument but a reflection of public feeling. The media says it whenever people get bored of the government and the opposition isn’t scarey. By the way, I don’t like the Labor government. ITs just that there were enough misrepresentations in what you had to say that I needed to correct it. As for who I’ll vote for, I’ll probably vote for whoever promises to take an active role in fixing Melbourne’s problems. A fresh, new government is more likely to be able to do that than a stale 11 year old one. With apologies to Daniel, that post was pretty much off-topic. Slightly more on-topic, although Richmond division is at risk to the Greens, I don’t think the government would weigh that very highly in deciding premium stations. People who vote for the Greens on public-transport related issues would probably want to see more frequent trains or new train lines, not staff at infrequently-served stations. Not that I like Myki, but still NO machine at Thomastown, which is one of the key factors why I don’t use it. No point in topping up online that doesn’t show for ages, and as per above the website is an abomination!! as is the system itself, don’t fix what aint broken! !